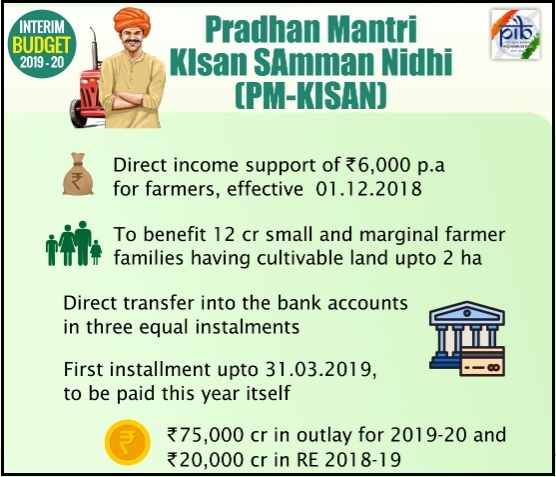 Ø PM Kisan Samman Nidhi (PMKISAN) - The Centre will transfer Rs 6,000 every year to small and marginal farmers in a new Rs 75,000-crore scheme that aims to address unrest among cultivators who have suffered due to adverse weather and weak prices. The funds will be transferred directly into the bank accounts of the beneficiary farmers in three instalments of Rs 2,000 each, starting retrospectively from 1 December 2018. The first instalment would be paid in the weeks ahead and the second may be due around the time of the elections. The PM Kisan Samman Nidhi launched will benefit 120 million farmers with cultivable land of up to 2 hectares. The scheme will be applicable for landowners only and not for tenant farmers. Ø Pradhan Mantri Shram Yogi Maandhan - At least 10 crore labourers and workers in the unorganised sector are expected to avail the benefit of the scheme within the next five years, making it one of the largest pension schemes of the world. This scheme offers a pension of Rs 3,000 per month after the age of 60 years to unorganised sector workers with monthly income of up to Rs 15,000. Under the scheme, an unorganised sector worker joining pension yojana at the age of 29 years will have to contribute Rs 100 per month till the age of 60 years while a worker joining at 18 years will have to contribute just Rs 55 per month. This would be matched by an equal contribution by the government to the pension account. The government has earmarked Rs 500 crore for the scheme. Ø Rashtriya Kamdhenu Aayog - The interim budget has proposed to set up an authority for the effective implementation of laws and welfare schemes for cows with a corpus of Rs 500 crore. The new Aayog will try to make cow more productive for farmers and encourage them not to abandon the cow when it is of no economic use. The government has also allocated Rs 750 crore for the Rashtriya Gokul Mission, which was launched in December 2014 for the development and conservation of indigenous breeds through selective breeding and genetic upgrade of nondescript bovine class. Ø Pradhan Mantri Jan Arogya Yojana - Finance Minister lauded the Pradhan Mantri Jan Arogya Yojana, popularly known as Ayushman Bharat scheme, saying that the world’s largest healthcare programme has successfully treated around 10 lakh people after having been launched only last year. Ø Saubhagya Scheme - Finance Minister said that the government is all set to provide electricity connection to every willing household under the Saubhagya scheme by the end of March 2019, after having missed the original deadline of 100% household electrification by the end of 2018. Ø Interest Subvention For Farmers - The government’s announcement of a 2% interest subvention for farmers hit by natural calamities and another 3% relief for timely repayments will help both afflicted farmers and banks trying to recover loans. Ø Interest Subvention For Animal Husbandry and Fisheries - Finance Minister Piyush Goyal announced a 2% interest subvention for farmers engaged in animal husbandry and fisheries who take loans through the Kisan Credit Card (KCC) scheme. Further, in case of timely repayment of loans, the borrowers will get an additional 3% interest subvention. Ø MGNREGA - The Mahatma Gandhi National Rural Employment Guarantee Act (MGNREGA) scheme was allocated only Rs. 60,000 crore for the next financial year, slightly lower than its revised estimate of Rs. 61,084 crore for the current year. Ø Allocation For SC and ST - Interim finance minister Piyush Goyal announced a 35.6% increase in Allocation for Welfare of Scheduled Castes (AWSC) from Rs 56,619 crore in 2018-19 financial year to Rs 76,801 crore in 2019-20. The allocation under the Scheduled Tribes component was increased 28% from Rs 39,135 crore in 2018-19 to Rs 50,086 crore in 2019-20. Ø Gender Budgeting - Finance minister proposed to increase the gender budget allocation to Rs 131,700 crore for 2019-20 from Rs 121,961 crore a year ago. Adopted by the government to tackle gender inequality in policy-making, gender budgeting looks at the budget through a gender lens. It has two parts: Part A reflects women-specific schemes with 100% allocation for women, and Part B is constituted by pro-women schemes wherein at least 30% of allocation is for women. Ø Allocation for North Eastern region proposed to be increased to Rs 58,166 crore in this year a rise of over 21% from the previous year. Ø Allocation for National Education Mission is being increased from Rs 32,334 crore in 2018-19 revised estimates to Rs 38,572 crore in 2019-20. 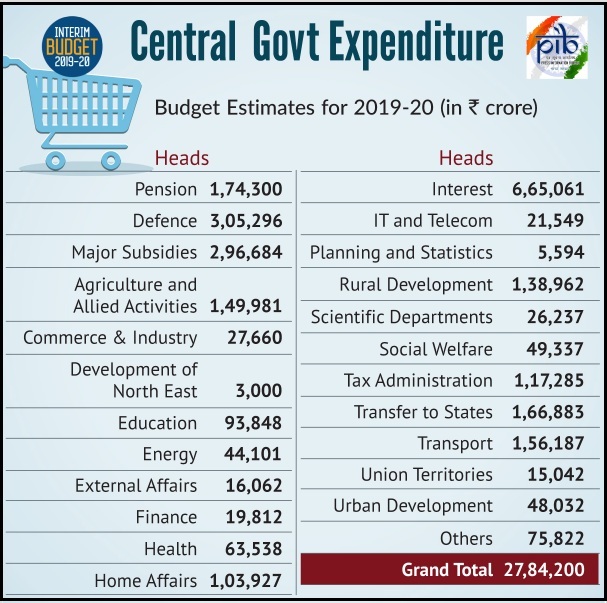 Ø Allocation for Integrated Child Development Scheme (ICDS) is being increased from Rs 23,357 crore in 2018-19 revised estimates to Rs 27,584 crore in 2019-20. Ø Demonetisation - The Budget speech also mentioned the government's big financial decision of demonetisation. The move succeeded in eliminating the black money. Demonetisation and other moves were able to bring back Rs 1,36,000 crores of cash to banks. More than one crore people filed income tax returns post demonetisation. Over 338000 shell companies were detected and their directors were disqualified. Ø Income Tax Rebate - FM proposed a full rebate for individual taxpayers having a total income of up to Rs 5 lakh. Currently, a rebate of Rs 2,500 was available to those with a taxable income of up to Rs 3.5 lakh. The budget proposed to increase rebate Rs 12,500 and eligibility to Rs 5 lakh. Assuming that a taxpayer takes the full benefit of the Rs 1.5 lakh available as a deduction for various investments under 80C (such as PPF, repayment of housing loan, LIC premium, tax-saving mutual funds), owing to the rebate proposal, a gross income of up to Rs. 6.5 lakh may not attract any income tax at all. If the proposed standard deduction of Rs 50,000 available to salaried taxpayers is considered, a gross income of up to Rs 7 lakh may not attract any tax. There is also 4% cess on total tax; 10% surcharge on tax if income above Rs 50 lakh and 15% surcharge if above Rs 1 crore. Ø TDS Threshold Increased - Finance Minister proposed to raise TDS threshold for interest earned on bank and post office deposits to Rs 40,000 from the current Rs 10,000. No TDS will be deducted from the interest income up to Rs 40,000. However, these interest incomes will still be taxable as per current income tax laws. Earlier you had to submit Form 15G to avoid TDS if your interest income exceeded the limit of Rs 10,000. A higher limit of Rs 40,000 means that TDS will not be deducted till your interest income from bank FDs and post office deposit schemes crosses this limit. This does not mean that the interest has been exempted and should not be confused with existing exemption to savings bank interest under Section 80TTA. It is only that interest income up to Rs 40,000 from bonds and fixed deposits will not be subject to TDS. Ø No Change For Senior Citizens - On the other hand, the interim budget has nothing in particular for senior citizens above 60 years of age and very senior citizens above 80. Last year’s budget had raised the TDS threshold for senior citizens to Rs 50,000. Also, very senior citizens have a basic exemption limit of Rs 5 lakh. So the proposed rebate will not affect them at all. Ø Fast Income Tax Processing - Finance Minsiter announced All returns will be processed in 24 hours and refunds issued simultaneously. Within the next two years, almost all verification and assessment of returns will be done electronically through anonymised back office, manned by tax experts and officials, without any personal interface between taxpayers and tax officers. Ø The Direct Tax Collection has been increased substantially. The number of returns filed have increased from 3.79 crore to 6.85 crore, showing 80 percent growth in tax base since four years. In 2018-19, 99.54 percent of the income-tax returns were accepted as they were filed. 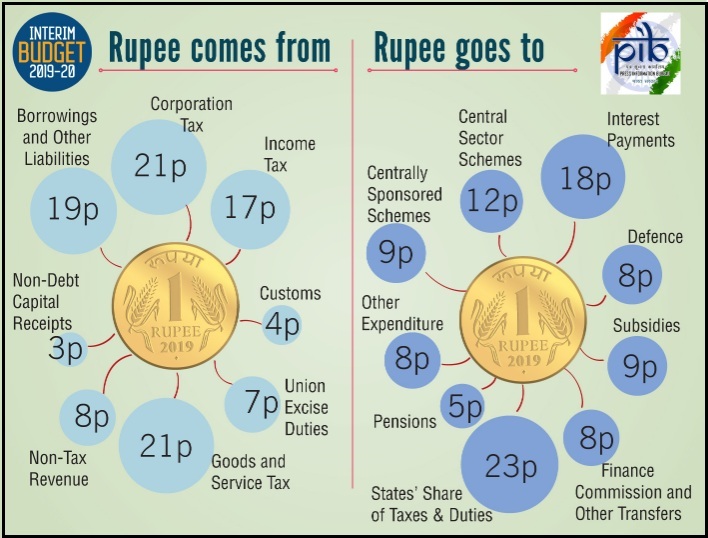 Ø The GST Collection for January 2019 is estimated at Rs 1.03 lakh crore. Ø Exemptions from GST for small businesses has been doubled from Rs 20 lakh to Rs 40 lakh. Ø Businesses with less than Rs. 5 crore annual turnover, comprising over 90% of GST payers, will be allowed to return Quarterly GST Returns. Ø Two Per Cent Interest Subvention on loan of 1 crore for GST registered MSME units. Ø Tax GDP Ratio - The tax to GDP ratio is budgeted to improve to 12.1% in FY20 from 11.9% in FY19. Ø Target For Disinvestment - The government set the disinvestment target for fiscal 2020 at Rs 90,000 crore, higher than the Rs 80,000 crore budgeted for the ongoing year that it said would be exceeded. The government has raised Rs 35,532 crore from asset sale so far in fiscal 2019. 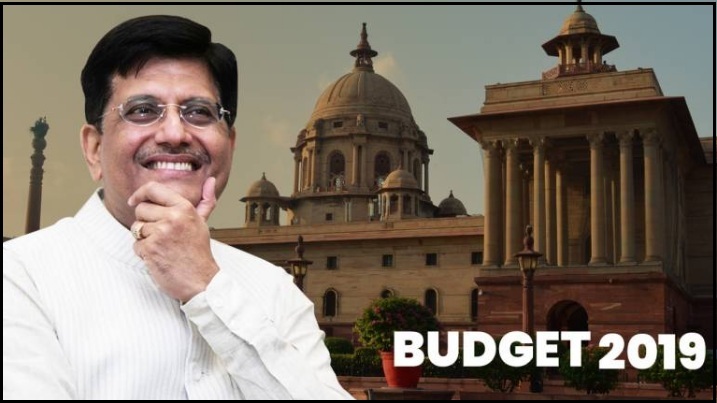 Ø Capital Expenditure For Railways - Finance Minister made the highest ever capital-expenditure allocation of Rs 1.58 lakh crore for the railways in the interim budget, while leaving passenger fares and freight rates unchanged ahead of general elections this year. Ø Railway's Operating Ratio seen 96.2% in FY19 Vs 95% FY20. Ø Allocation For Defence - The allocation for Defence in this year’s interim Budget stood at Rs. 3.18 lakh crore and Defence pensions at Rs. 1.12 lakh crore compared to last year’s allocation of Rs. 2.95 lakh crore excluding pensions. Ø Highest Allocation For Home Ministry - Allocation for the Ministry of Home Affairs (MHA) exceeding Rs 1 lakh crore for the first time. Finance minister allocated Rs 1,03,927 crore to the MHA, Rs 10,477 crore more than that for the previous year. Ø 2030 Vision For Electric Vehicles - The government’s commitment for a ‘Clean & Green’ India through proposals in the interim budget such as measures to reduce the use of fossil fuel in a phased manner by 2030 is expected to ensure faster adoption of electric vehicles (EVs) and environment friendly mass transportation in the country. Ø Single Window Clearance for Filmmakers - Union Minister Piyush Goyal announced that there will be a single window clearance for Indian filmmakers and anti-camcorder regulations will be introduced in the Indian Cinematograph Act to prevent piracy. The single-window clearance mechanism, which provides a one-stop shop to seek permission to shoot at locations within India, was limited to foreign filmmakers so far. Ø Amendment in Stamp Duty - The Finance Bill - 2019 proposes amendment in Indian Stamp Act, 1899 for better administration of stamp duty collection on securities market instruments. It proposes that Stamp duties would be levied on one instrument relating to one transaction and would be collected at one place through the Stock Exchanges. The duty so collected will be shared with the State Governments on the basis of domicile of buying client. 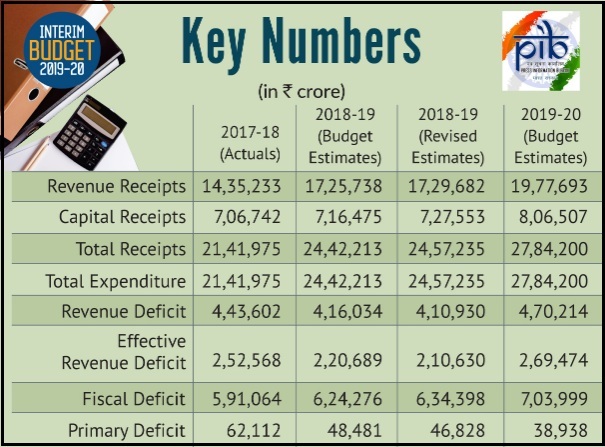 Ø Fiscal Deficit brought down to 3.4% in 2018-19. It is pegged at 3.4% of GDP for 2019-20, Target of 3% of fiscal deficit to be achieved by 2020-21. Ø Current Account Deficit (CAD) likely to be 2.5% of GDP this year. Ø Inflation from 10.1% during 2009-14, inflation in December 2018 was just 2.1%. Ø A National Centre on Artificial Intelligence Centre to be set up. Ø Gratuity Limit increased from 10 lakh to 30 lakh rupees.